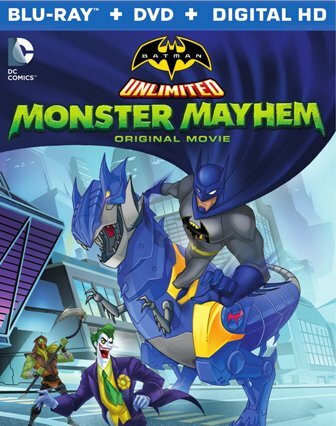 The latest Batman animated feature, Batman Unlimited: Monster Mayhem, has recently been issued by Warner Bros. Home Entertainment on Blu-ray, DVD, and Digital HD. This one is a sequel to Batman Unlimited: Animal Instincts, released back in May, and it continues to tie in with the Batman Unlimited Mattel toy line. If that kind of cross-marketing usually raises a red flag, don’t let it throw you. Yes, these Unlimited movies are, generally speaking, aimed at a younger audience than the darker, PG-13-rated DC Animation fare, but they’re still a lot of fun for fans of any age. While it’s true the underlying marketing plan involves selling more toys and accessories that are part of the Batman Unlimited line, these features stand pretty well all on their own. Monster Mayhem delivers exactly the same brand of candy-colored, frenetically-paced, and overall harmless action seen in Animal Instincts. On Halloween night in Gotham City, several notorious Arkham Asylum inmates have escaped. 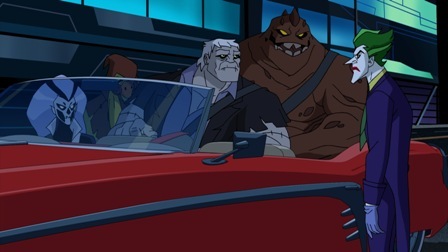 Silver Banshee (voiced by Kari Wuhrer), Solomon Grundy (Fred Tatasciore), Clayface (Dave B. Mitchell), and Scarecrow (Brian T. Delaney) are wreaking havoc on Gotham’s residents. 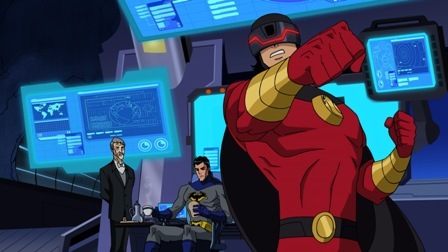 Of course, Batman (Roger Craig Smith) and a number of allies – including Red Robin (Yuri Lowenthal), Cyborg (Khary Payton), Green Arrow (Chris Diamantopoulos), and Nightwing (Will Friedle) – have to rally in order to stop the attacks. Okay, that’s a lot of characters but, just as was the case with Animal Instincts, variety is part of the key to the Unlimited movies’ success. With all these superheroes and villains tossing out one-liners (some admittedly weaker than others; writer Heath Corson allotted more than a few groaners to Solomon Grundy, in particular), there’s always one distraction or another to keep viewers hooked. Also not unlike the previous entry in the series, The Joker (Troy Baker) is pulling the strings. He’s set to unleash a computer virus that will potentially cripple all of Gotham. On the down side, Monster Mayhem does end up devolving into a bit of a plot-light/action-heavy extended climax that doesn’t offer quite enough in terms of plot development. That’s a bit of a nitpick, however, as the point of this comic book lark is to keep kids engaged for about 80 minutes (just be prepared to squirm with impatience a bit as the final act begins to run low on inspiration). All of this looks pretty great on Warners’ Blu-ray with cleanly-presented animation that offers great clarity and bold colors. The audio is presented in a full-bodied DTS-HD MA 5.1 lossless surround mix. Let’s keep in mind that Monster Mayhem is, after all, a made-for-video production, but even given whatever limitations the budget might’ve imposed this is a sufficiently rowdy, rockin’ soundtrack. Veteran video game and film composer Kevin Riepl returns from Animal Instincts with another prominently-featured score. Special features on Batman Unlimited: Monster Mayhem are a little sparse. The only item specific to the film is “Gotham of Tomorrow: Designing a Future World,” an 11-minute featurette that sheds some light on the visual design of the city. There are also ten “DC Nation Shorts” (totaling about 20 minutes) and an episode of Batman: The Brave and the Bold, “Mayhem of the Music Meister!” The Blu-ray Combo Pack also includes a standard DVD and a Digital HD copy.